I shouldn't be telling this truly story but I would like to warn all innocent children about the dangers of asking for trick-or treat in Halloween night. It was an odd huge ancient house which was located in Elm Street. Patrick walked up the wooden path so I followed him and we came to the front door. On the door was hanging a handle and above the doorbell was a sign that read: ‘’you will die’’. But my friend had already rung the doorbell. While the door was opening with a screeching sound, a white-haired old woman appeared. Although she was very old, her eyes were like devils. ‘’What do you want?’’ she asked with a deep voice. I couldn’t say anything, I was too scared so Patrick managed to say ‘’Trick or treat’’. ’’Wait a moment, I’ll give you a fine present’’ answered the woman. She held us out a black box. When we opened it I couldn’t believe what I saw! Inside the box it was like a dead animal with all the guts out and with a kind of head crushed. While blood was falling through our hands, we shouted and looked at the creepy woman how she was laughing evilly. Suddenly, we ran to escape from that nightmare but Patrick ran to the opposite direction and I lost him. I arrived at a small house and while I was breathing widely, I saw an old man. I asked him for help and he warned me that I shouldn’t be there at those hours as that it was extremely dangerous. Then, he explained to me that a witch was hunting kids for feeding his evil creatures. I was terrified and I couldn’t stop thinking of Patrick. I spent the night in the old man’s house and, the next day, when I was walking home, I heard Patrick’s voice. It came from the cemetery so I decided to have a look. At every step I was doing I was feeling more afraid. There was something odd in that place… Finally, I saw somebody behind one of the tombs. I got paralyzed when I realized that the body of my friend was lying on the ground. Patrick was completely dead. I caught a bloody letter which was next to him. 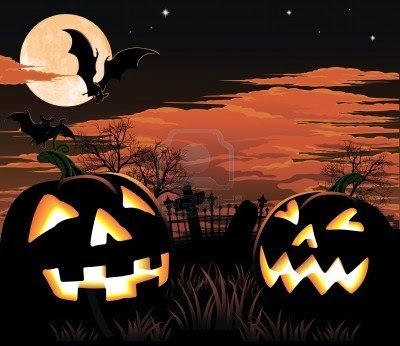 I shouted with horror when I read: Your friend will be the next Halloween present for kids who knock at my door asking for ‘’trick or treat’’ ha ha ha !!! *Conte premiat en la categoria de Batx i CF en el IV Concurs de microrelats de terror 2013, organitzat per la biblioteca amb el suport dels departaments de Català, Castellà i Llengües estrangeres de l'Institut Cristòfol Despuig.